Randy Wolf makes his first start of the year today for the Brewers. He’s pitching against the Rockies, with whom he has a 5 – 3 record. Good luck Wolfie! The Brewers have lost to the Rockies seven straight game. Let’s break that streak Wolfie and start a new one. Hehe here’s the list of Wolfie’s no-decisions last season. He had 16 no-decisions. 11 at home, 5 on the road. Of the 11 at home, I went to 8 of them and one on the road. Okay, so I understand last year Wolfie wasn’t able to participate in the Dodgers’ caravan because they didn’t sign him until the event was already done. The lucky Brewers fans however get him as part of their “On Deck” schedule. Not sure how the event works … but that’s okay. It was in Milwaukee, and here I am in Los Angeles. I am looking forward to the series in May. 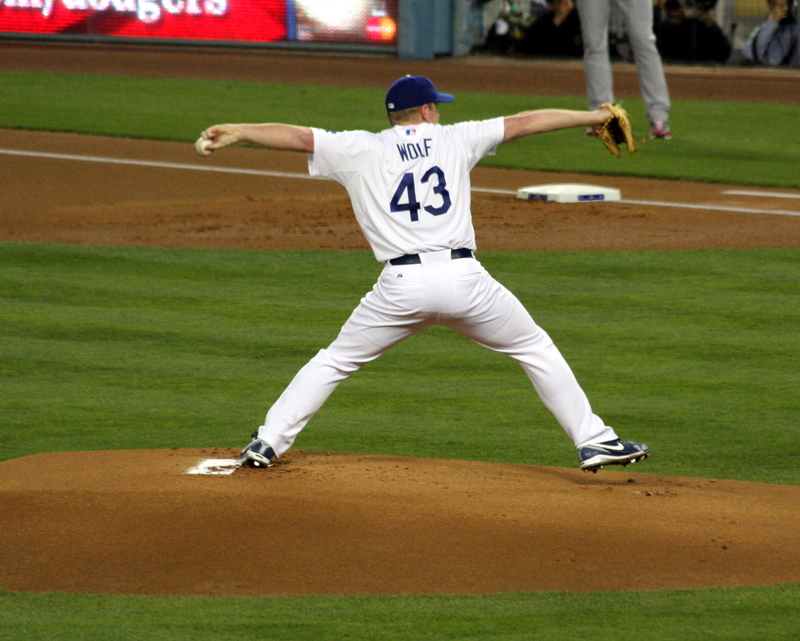 Okay, so I know it was hopeless and would take a miracle for the Dodgers to re-sign Randy Wolf. But hey, a girl can cross her fingers and hope, right? After all, after a long off-season last year where Randy remained unsigned through most of the season, I kept hoping that maybe the Dodgers would sign him. I didn’t think it would happen, but I was still hoping. Well, I was at school yesterday … and I got online to check the newswire for anything … and just about fell out of my chair. It said Wolfie was nearing a three year deal with the Brewers. Yes, I was hoping that somehow the Dodgers would sweep in at the last minute, like it did with Raffy… but I knew it wasn’t going to happen. 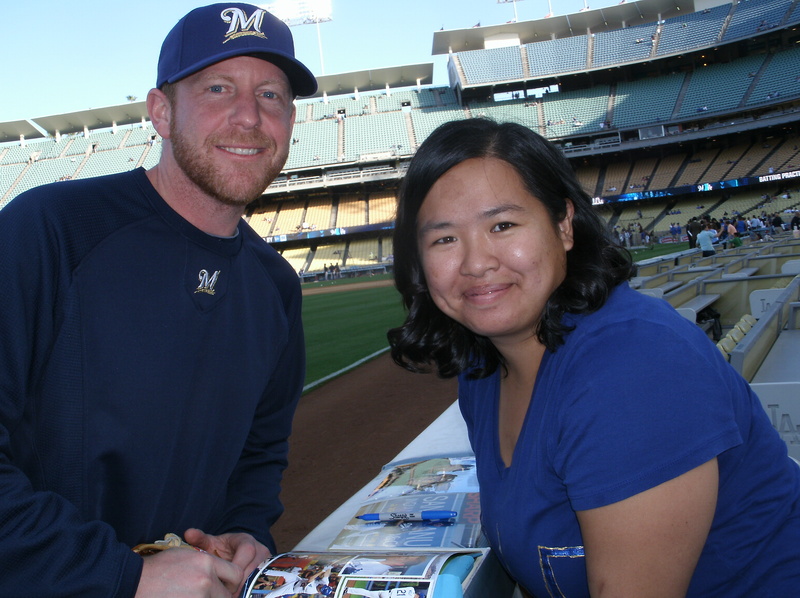 Guess we know what three games I’ll be at for sure next year… May 4th, 5th, and 6th … the three game series against the Brewers… Think he’ll remember me? Tonight was the first play off game for me as well as my friends Chris and Chelsea … and our starting pitcher, Randy Wolf! Love this picture!! He came out through the bullpen. You never know with Randy. He either comes out to warm up from the bullpen or from the dug out. You can never guess. Anyway, I’m getting ahead of myself. I found out the gates were opening at 4. So I headed out before three. I needed to get chex mix (for JoAnna), a newspaper, and something for dinner. I went to Ralph’s. They didn’t have the Chex Mix that I was looking for. Or any for that matter. I bought a turkey sandwich from the deli. They didn’t have any individual packets of mayo … so I figure I might ask Pat if they had any inside the baseline box club. I get to the Golden State Gate … and most of the street parking was already taken. I managed to find a spot. My friends Chris and Chelsea were already there. I passed them when I was coming up. They park inside and offered to give me a lift in. Chris won two tickets to the game. He was notified early this week. He was telling me about the game he went to on Sunday … and when he mentioned he was holding their tickets … I suddenly remembered … I LEFT MY TICKET IN MY CAR! So, I got out of their car, walked back to my car, and got my ticket. Good thing there were still thirty minutes till the gates opened. 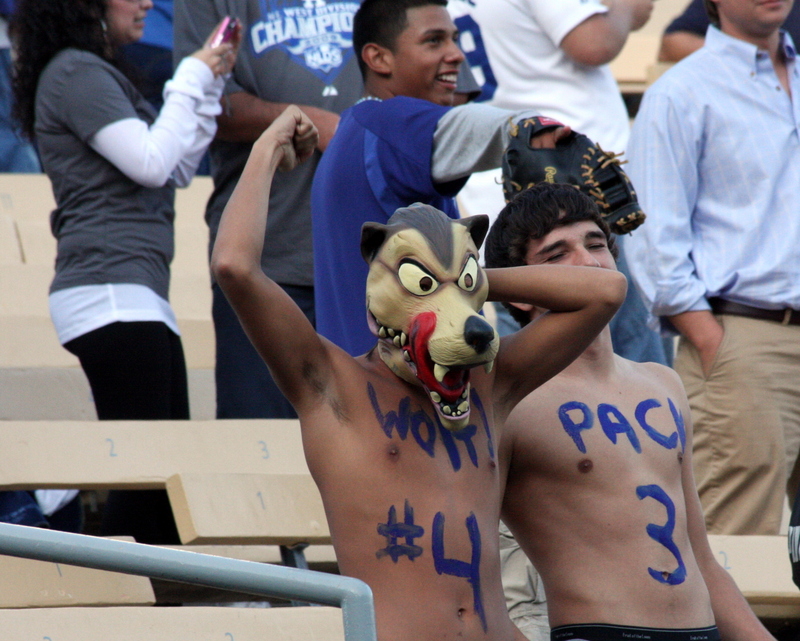 There were these two guys in the pavilion who were shirtless and painted “Wolf Pack 43” on their chest. One had “Wolf 4” and the other had “Pack 3”. “Wolf 4” also had the “big bad wolf” mask. I was surprised they let him bring it in. I get told all the time that I may not be allowed my Wolf hat … and it’s a HAT. His is a mask. That’s interesting. And in fact, one of the security guys tonight was like … “I don’t think you can wear that.” I seem to be going through this a lot lately. I don’t know why. No one said anything the first ten times I wore it. But the last five or six times, I seem to be getting some trouble. Come on now. Even Randy Wolf has seen me in my hat! Oh, and here’s a tip for guys who go shirtless. Make sure your boxers aren’t showing! I cropped them out in the picture … but you can see the top of “Pack 3″s boxers. During the visiting team’s batting practice, the grounds crew comes out and starts working on the field. One guy usually paints the foul line in the left field while the other guys stand guard. What are they standing guard for? Fly balls of course! Do they ever warn the guy painting the line? Not really. 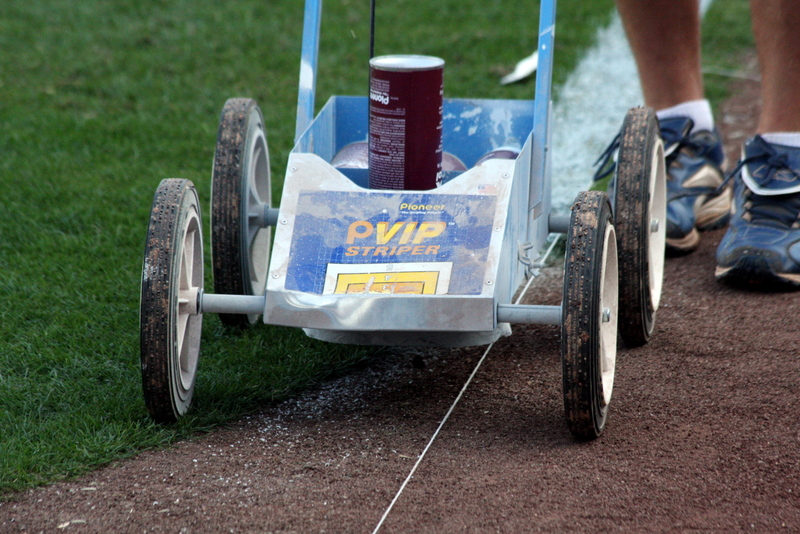 Tonight was crazy because the ball actually hit the little cart that he uses to paint the lines with. The ball even dented the front of it. He’s always giving his crew a hard time about not giving him any warning when the ball comes at him. Randy Wolf is making his post-season debut. He’s been in the majors for 11 years, and this is his first time in the post season. When he signed with the Dodgers this year, he joked about his post season jinx … how he seems to sign with teams right before or or right after they make a run at the play offs. Example: Phillies. He signed with them after their last play off appearance … and they never made it when he was with the team. Then after he leaves the team for the Dodgers, the Phillies made it to the play offs. That was the year they were swept by the Rockies. 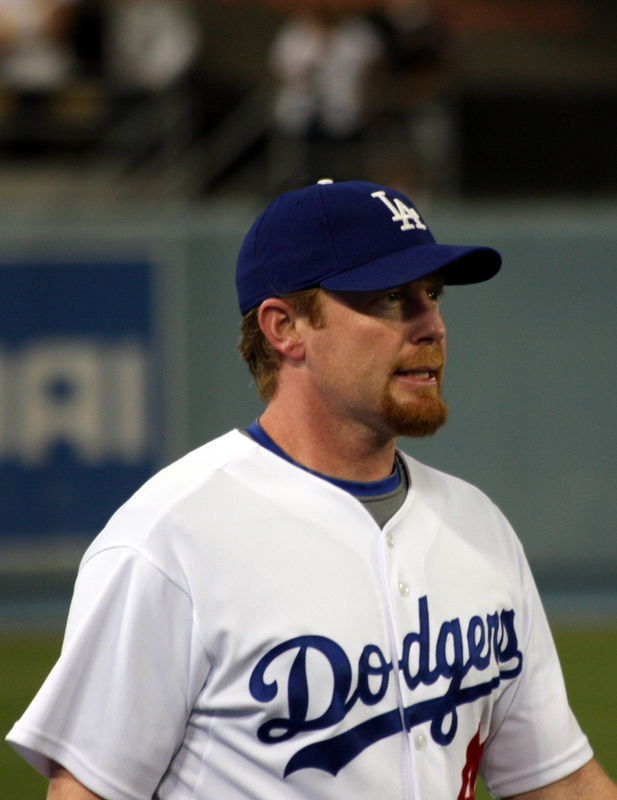 Example #2: He signs with the Dodgers the year after they made it to the play offs in 2006 … but they fall short in 07 with him. 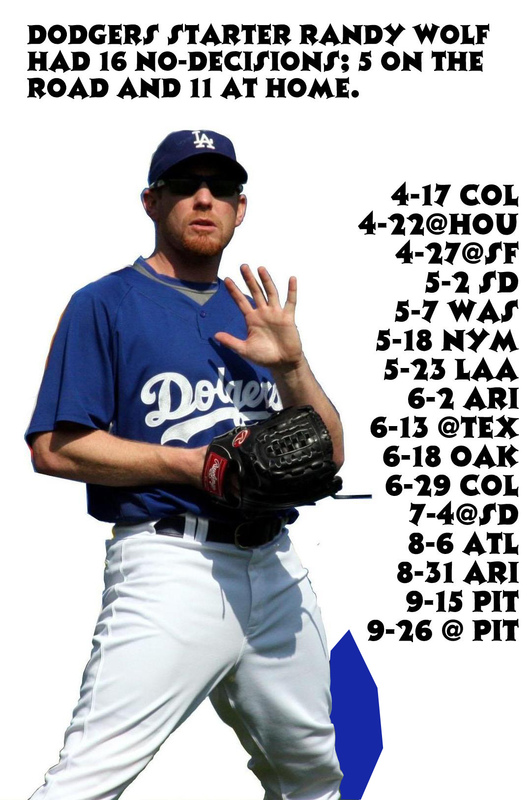 He then signs with the Padres the next year (who barely missed making the play offs in 07) … the year the Dodgers make it to the NLCS. I was so excited when Randy was warming up … he was in my direct line of sight! I was also very nervous! That ball was moving very fast. I took some videos of it. I’ll try to post them up on my YouTube page. But it was a little scary how fast that ball is moving. I know he won’t miss … but if Rob Flippo (the bullpen catcher) did … I’ve been hit once in the face with a soft toss. I don’t even want to know what it’s like to get hit in the face with a ball moving 80-90 MPH. Still, it was great to know that he was in my direct line of sight. Wonder if he saw me… He probably doesn’t look into the stands when he starts … but I was wearing my Wolf hat. Which got shown on the Dodger Vision during batting practice. I held up my Wolf shirt (the guy holding the camera was surprised. He asked me, “You got more?”) I held the shirt so all you could see was my eyes and the Wolf hat. I hate being on video. Unfortunately, Randy only lasted three and two-thirds innings. I joked that he struggled in the first inning because I wasn’t wearing my hat. Some of the ushers I know joked with me that they’ll hold me to it. What was also unfortunate that tonight was quite a crazy and dramatic night for the fans. We (the guys around me) noticed that there was some commotion going on in the left field pavilion. Sure enough, these two guys were being escorted down the steps. One of the guys was resisting and I don’t know who pushed him … but he got pushed and fell down quite a distance. Maybe five, ten rows? He landed on the bottom and didn’t look like he was moving. The other guy being escorted was resisting and had to be carried out. In the video I shot, you can see him trying to grab the railing as they carry him out. The other guy eventually got carried out too. There was also a cat fight a few sections to my right in the top deck. 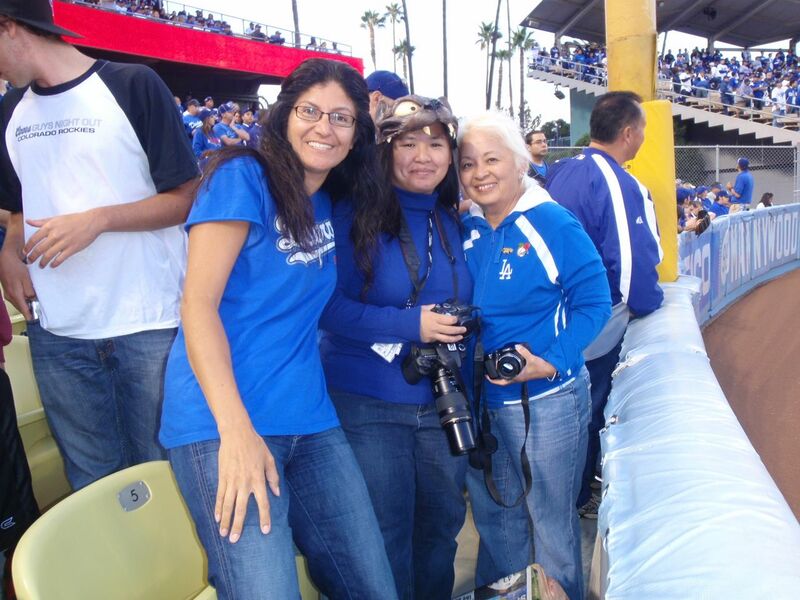 Yes, it was between a Cardinals fan and a Dodger fan. Somehow, the Cardinals fan fell down about three rows. She was able to get up and walk out. It was a crazy night. The Dodgers scored two runs in the first inning off a homerun by Matt Kemp. Raffy was on base. The final run was scored when Russell Martin was hit by a pitch with the bases loaded. It was a very long game. Almost four hours. With twelve pitchers used, thirty men left on base, and three batters getting hit. I don’t think anyone was surprised when Russell got nailed. There were one or two other pitches that were close before the last one nailed him. More pictures and game recap to come later. I’m just tired and achy to continue. Maybe during the off season I’ll just post pictures of a different player every other day or so. Yet another No-Decision for Randy Wolf. That’s No-Decision #16 . He’s got 33 starts, 11 wins, and 6 losses. for most. Well, there’s still another pitcher who’s close behind. per inning, hits per nine innings. each have 6 losses. Randy has 11 wins, Joba 9, and Roy 8. Anyone have a copy of the OC Register???? I think it was either in Monday or Tuesday’s paper of the OC Register. Anyone out there still have a copy they’re willing to give up???? 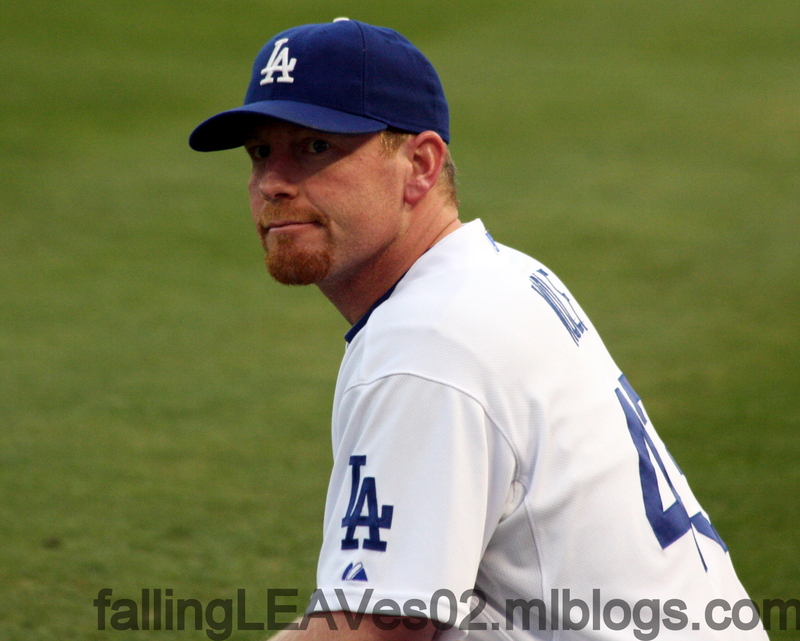 The Dodgers’ Randy Wolf has been as consistent as any starting pitcher they’ve had. If this is indeed the year of the Freeway Series, it also might be the year of the Five Million Dollar Men. connected the loose ends of the Angels lineup. rotation would have careened off its axis long ago. NL and lower than that of Johan Santana and Roy Oswalt. rotations because of an elbow problem that required Tommy John surgery. Wolf, who turned 33 on Saturday, is grateful for health. He patiently corrects those who assume he hasn’t maintained it. there’s no way I only throw 84 mph,” he said. control, and knives plunged in. As you might have noticed, pitching is weird. a fluorescent light that works gradually. Houston charged up the NL Central standings, Wolf was 6-2 in 12 starts. 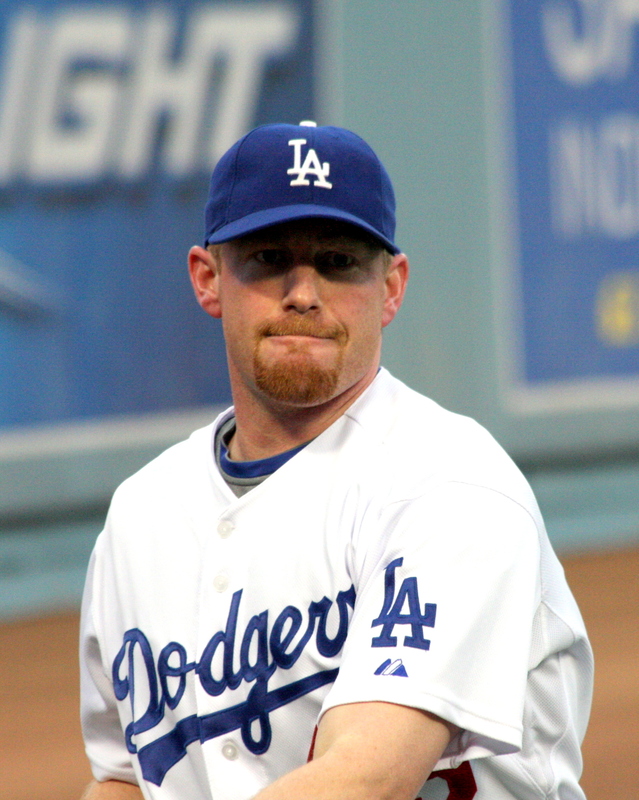 The Dodgers signed him for $3 million less than in 2007. Billingsley is 12-7 and Kershaw 8-7 with a 2.96 ERA. others, and nobody asks to examine your holdings.